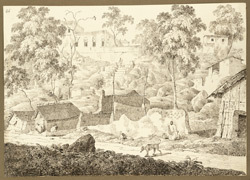 Pen and ink drawing by Sir Charles D'Oyly (1781-1845), of the view of the back entrance to the Summum Burj at Gaya in Bihar, from an Album of 80 drawings of views in Bengal and Bihar taken between January 1823 and May 1825. The largest group of drawings consists of sketches made between 26 January and 27 February 1823 during a journey from Calcutta to Gaya (Bihar) along the 'New Military Road'. Another group, drawn between 18 December 1824 and 2 January 1825, were clearly made during a Christmas tour to Gaya when D'Oyly visited his friends George Proctor Beauchamp and Christopher Webb Smith. The 'New Military Road' passed through Manbhum district (Bihar) to Hazaribagh (Bihar) and through the hills to the N.W. to join the present Grand Trunk Road near Sherghati (Gaya district, Bihar). Begun in 1782, it had semaphore signalling towers built along it in the early years of the 19th century. Gaya, near the sacred site of Bodh Gaya, where Buddha achieved enlightenment, is also a very important site for both Hindus and Muslims. This image is the original drawing for plate 15 of 'Sketches of the New Road in a Journey from Calcutta to Gyah' (Calcutta, 1830). D'Oyly wrote, "The character of the city is shewn...distinctly: [the Summum Burj] has the remains of a fine flight of steps, descending to the Road, cut out of the natural Rock, or composed of the same materials. This Road leads to the Great Temple of Bishenpud [Vishnupad], built of black stone. the sculpture of the component parts of the Temple of Bishenpud, is exceedingly fine particularly of the ornamented pillars, supporting the front porch and of the figures of the Hindoo deities, let into recesses or leaning against the walls, donations from the pious. The River Fulgo is a mountain stream, and even in the rainy season, is seldom filled with water; which recedes in the course of a few hours, after a heavy fall, leaving a bed of sand intersected by narrow streams. The force of the current when it is full almost baffles its navigation even by Boats of the smallest kind, and while it lasts, all communication between its banks is rendered impracticable. A few canoes formed of the hollowed trunk of the Tar-tree are sometimes seen venturing in the current."